There is a huge choice of car parks and hotels at Gatwick airport, and a huge choice of booking websites offering you the ‘best rates in the business’. We list three sensible options here. We welcome your feedback on any of these companies so we can keep this information as up-to-date as possible. Security note: in the past, various people who booked a meet and greet service online told us that they either couldn’t get hold of the company to drop off their car (and had to pay £104 to park in the Gatwick long-term car park) or couldn’t contact them to collect their car at the end of their holiday (and finally got the car back on Tuesday rather than Sunday). If a deal online looks too good to be true, it probably is! The companies mentioned below have all been used by our own staff. 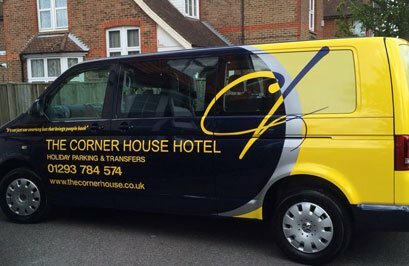 Cophall Parking is a friendly off-airport shuttle parking service, and has been operating at Gatwick Airport for over 30 years. They have an exceptionally high customer service level, and offer winter parking from as little as £31.75 per week. In view of the security note above, they hold a ‘Park Mark’ security award, the Trading Standards “Buy with Confidence” Award and the “Meet & Greet Approved Operator” award issued directly by Gatwick Airport. The car park operates 24 hours, 7 days a week, with staff always on site and the compound is barrier-controlled with CCTV cameras and patrolled, so your car is safe while you are away. They are located at Copthorne, approximately 10 minutes from the airport terminals, and they operate to request. On arrival you are driven to the airport in a courtesy minibus, and on your return you telephone the freephone number provided and they come and collect you. The minibuses can carry skis and snowboards. 15% discount for YSE guests. www.cophallparkinggatwick.co.uk To check prices, make a booking and claim your YSE discount, go to the Cophall Parking Gatwick website, register with them (this gives 10% off) and enter the code YSE15, or telephone 01342 712 779 stating that you are travelling with YSE, which will take the discount up to 15%. The UK’s largest website booking service for airport parking and hotels, Holiday Extras offers a wide range of options at Gatwick, Heathrow, Manchester and Stansted. The earlier you book, the better the price, with non-peak dates also having frequent special offers from around £34 for park & ride on certain dates. They also offer meet & greet, airport hotels, a door-to-door taxi service, car wash, etc. www.holidayextras.co.uk Click to book (the YSE code will be entered automatically for your booking), or telephone 01303 815 424 giving code HX 068. Please note, when using their online form, the YSE flight number does not show up in the list of flights (because it is a charter flight), so you should choose ‘continue without flight number’ in the flight number field. A family-run hotel located in Horley, 3 miles from Gatwick North Terminal. En-suite and standard bedrooms, bar and restaurant. Continental breakfast served from 6am; full cooked breakfast from 7–11am. Minibus to the airport takes about 5 minutes. Free wifi. Room prices start at £45 for a standard single room-only (without breakfast, parking or transport), or £60 for standard single room with breakfast, one night’s parking and transport to and from the airport. There is secure parking, adding approximately £49 for a week. The Corner House has frequent offers for parking and/or rooms. 5% discount for YSE guests for accommodation. Ring 01293 784 574 or book online. To claim your discount, please state in the online booking notes (not the offer code box) that you are travelling with YSE.